This winter, I finally got the chance to try making some warm winter wearables from a few pieces of weavings I have been producing. Mostly I have been making scarves, but I really wanted to make a more substantial wrap or jacket. The widest piece I can make on my Saori loom is 42cm (16.5inches), so I made a warp that was the widest possible and the longest possible from my supplies so that I would not run short. The simplest plans for a poncho seemed to be two strips sewn side by side with an opening in the center for the neck hole. I had lots of sturdy cotton green warp, and plenty of 100% wool in two shades of blue that came from the local second hand store. 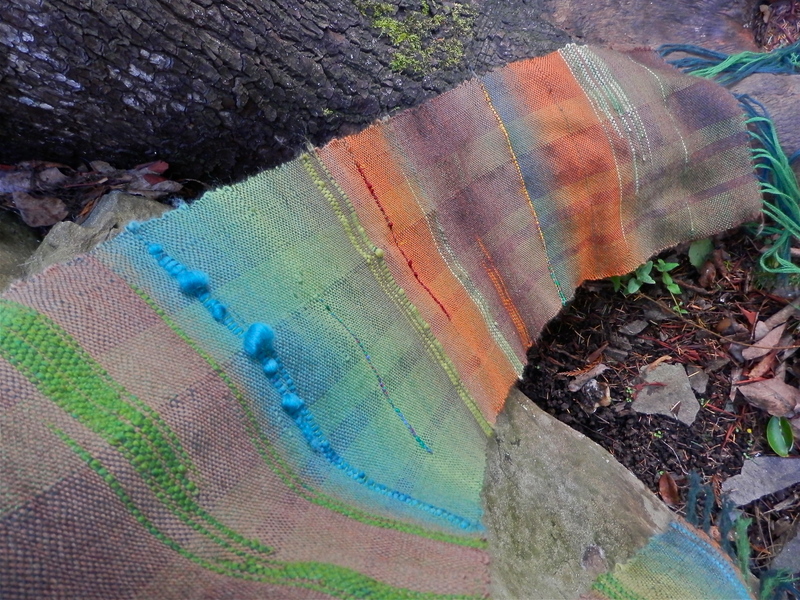 I mixed it up with a multi-coloured merino in blues and greens and yellows, and I occasionally placed a line of light green roving for texture. Using only these yarns, I experimented with all that can be done with three choices. It was a new practice for me, especially with such a large piece to fill. Usually I can’t help adding more and more variety. Off the loom, I cut the fabric in half and sewed one half of it together down the sides. I decided to leave the other half open, like a vest poncho. I may add large buttons on the sides under the arms to keep it more securely closed all around, and who knows, I may decide to sew up the front, too. I have passed it over to my mother to wear, so it is an open ended project depending on her comfort! With the second piece, I was looking to make something more with more drape. I picked up a single, large skein of a fine, almost lace weight merino and wool blend that had long, autumn toned colour changes. In my buckets, I found two skeins of lace weight alpaca in two shades of green that I hoped would be enough for another wide, long warp. Without interrupting the weft too much, I added accents and highlights whenever the bobbin and shuttle ran out and there was a slight break in the colour changes. I had a ball of recycled silk sari yarn, two toned green alpaca, light green roving, blue roving, and some leftover bits of green and orange peace fleece wool from a knitted sweater project. (Weaving satisfies my need to use up all the little bits of yarn from knitting. They just can’t be used very easily otherwise!) I was so happy with the feel and drape that I didn’t want to cut into it at all, and I wanted it to lie flat and simple as a garment So I folded it once on an angle at the back, letting each side come down straight in the front. I wove up another section using mostly black linen on the same warp, and added the same accents as in the rest of the piece, and used it across the back, sewing it to the sides and across the back fold of the other piece. By adding a simple fastener at the front, it can be held together or left open. For being so light weight, it is so warm! Thanks to my daughter who took all the modelling photos. A new role for both of us.